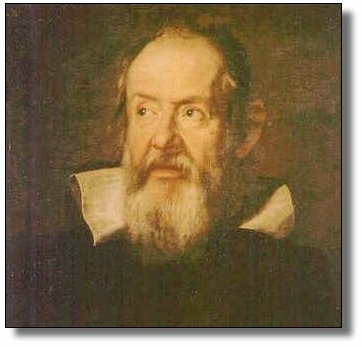 Galileo Galilei (1564-1642) was a Renaissance Italian who brought the scientific method to bear on physics, creating the modern version of the science. Coming from a noble but very poor family, Galileo had to drop out of medical school at the University of Pisa when he ran out of money. Eventually becoming a lecturer in mathematics at the same school, he began a career as a notorious troublemaker by writing a burlesque ridiculing the university's regulations - he was forced to resign, but found a new teaching position at Padua. He invented the pendulum clock, investigated the motion of falling bodies, and discovered the moons of Jupiter. The thrust of his life's work was to discredit Aristotle's physics by confronting it with contradictory experiments, a program which paved the way for Newton's discovery of the relationship between force and motion. In chapter 3 we'll come to the story of Galileo's ultimate fate at the hands of the Church.